Rock N' Roll: loud, proud, and smothered in attitude... that's the jam that NYC hard rock quintet Diablo Royale kicks out. The band's lyrics cover everything from sexual innuendos to political satire, Choy explains: "We write about anything and everything, no subject is off limits for us because there is so much stuff that happens to you everyday, be it the girlfriend, the boss, parents, government or just stupid stuff like getting too drunk or having one of those horrible days at work ... those are all life experiences that everyone can relate to at some point or another." 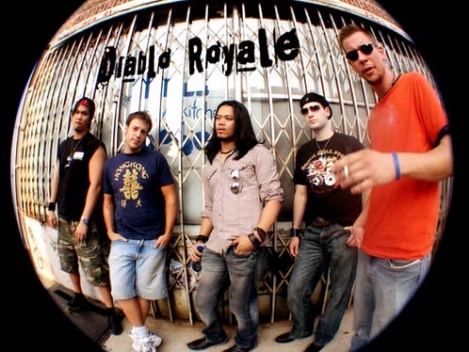 Diablo Royale came together in 2005 when, guitarists Eric Choy and Gerard Steixner got together with drummer Mike Sankari to create a band that would encompass their idea of what rock n' roll should sound like. The three began writing and auditioning musicians for over a year when they finally met Adrian Barrios and bassist Jason "Sweet" Leaf through an ad posted on the internet. With the lineup complete the five hunkered down in a basement studio in Williamsburg, Brooklyn (appropriately named "The Sweatshop") and crafted their first ten songs until they were ready for wax on their self-titled debut album, released in February 2007. Taking their influences from all the best bands ranging from Aerosmith to Zep, the final result can be best described as a bombastic sonic assault on the ears that is sure to knock you into next week! When it comes to being onstage, vocalist Barrios seethes with the kind of reptilian charisma that rock fans instantly find mesmerizing. Choy's guitar heroics are complimented by Steixner's stone cold consistency while the rhythm-section interplay between Leaf and Sankari is like a knockout combination from a heavyweight champ. In a short time the band has managed to cut their teeth in the local clubs of New York and as bassist Jason Leaf puts it, "We're looking to infect the masses with our brand of rock n' roll!"